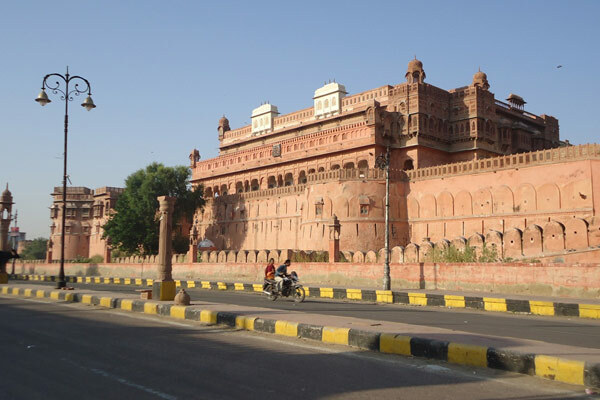 Constructed at the end of the 16th century by the third ruler of Bikaner Rai Singh, Junagarh Fort is protected by a 986m long sandstone wall with 37 bastions, a moat and, most effectively of all, by the forbidding expanse of the Thar Desert. Not surprisingly, the fort has never been conquered, a fact which explains its excellent state of preservation. 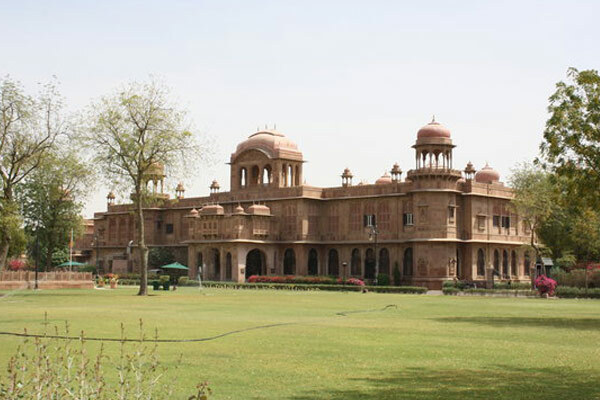 It houses 37 profusely decorated palaces, temples and pavilions made of red sandstone and white marble. The fort is called “a paradox between medieval military architecture and beautiful interior decoration”. 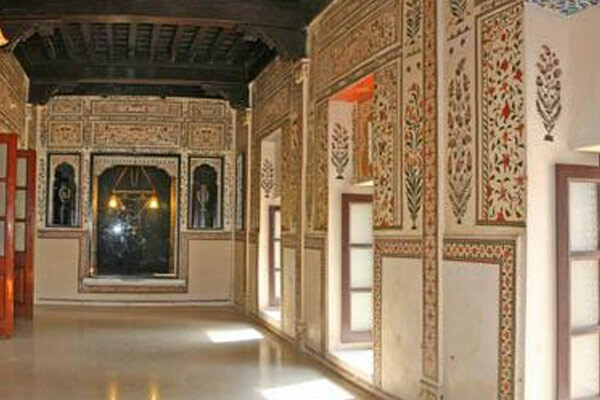 Located inside the Junagarh Fort, the Museum houses antique displays of royal family and famous handicrafts of Bikaneri artisans. The souvenir shop at museum sells decorative items. 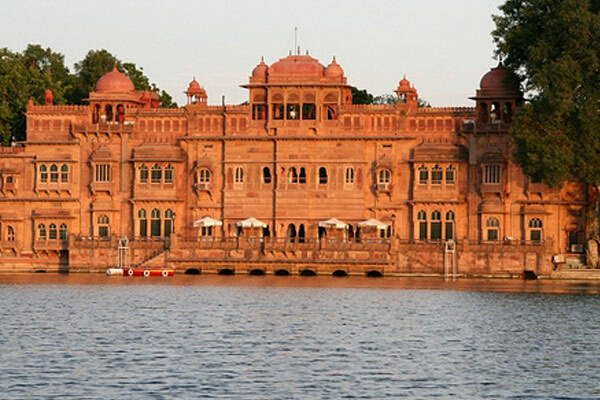 On the outskirts of the city, these imposing, reddish-pink local sandstone palaces were built between 1898 and 1926: a sprawling extravaganza of carved friezes, jails, pillars and arches in a style that combines traditional Rajput and European Renaissance, with Art Nouveau décor inside. Part of it has been converted into a hotel, and another section into a museum of vintage photographs and wildlife trophies. Its beautiful, lush green gardens with peacocks are also open to visitors. During their 1905-06 India tour, Their Royal Highnesses the Prince and Princess of Wales (later King George V and Queen Mary) notes: "The Laxmi Niwas Palace is the most perfect modern building in the Indo-Saracenic style in India (…). Their Royal Highnesses have not been more splendidly housed since they landed in Bombay." 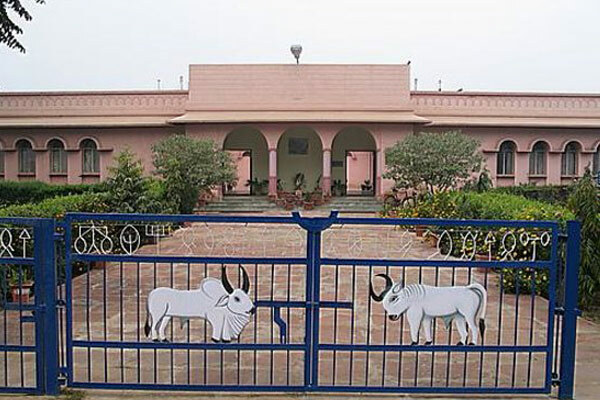 This museum features a rich collection of antiquities from Harappan civilization (Gupta and Kushan era) as well as a separate section of arts and crafts and beautiful collections of medieval musical instruments, royal furniture, paintings, weapons and others. A stroll down the KEM road and in the old walled city, entered through Kote Gate, will reveal the shopping pleasure in Bikaner’s bazaar. The purses and slippers made from the camel hide are worth a bargain. Camel skin also ends up as cushions and lacquered lampshades. Local carpets, woodwork and beautiful miniatures in the Bikaneri style are very popular among the tourists. And who can forget the Bikaneri Bhujias made of camel's milk, or others sweets and savory snacks renowned throughout India. In this one-of-a-kind institute in India (and maybe in the whole world), the tourists can see camels of different breeds and their behaviors. 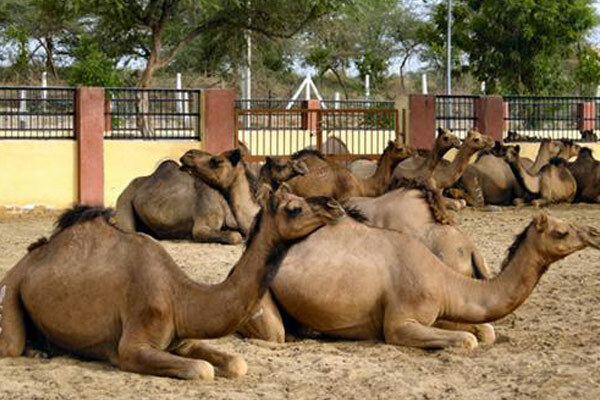 A camel museum apprises them of the developmental and research aspects of the camel in the desert ecosystem. Camel milk parlor is a special attraction featuring unique added value camel milk products such as ice-cream or hot and cold beverages. Of Bikaner’s two Jain temples, this 14th century monument is particularly beautiful, with yellow-stone carvings and dizzyingly vibrant paintings. The interior is stunning, rich in mirror work, decor and frescoes. The pillars bear floral arabesques and depictions of the lives of the 24 tirthankars (great Jain teachers). It’s said that 40,000 liters of ghee were used instead of water in the mortar, which locals insist seeps through the floor on hot days. 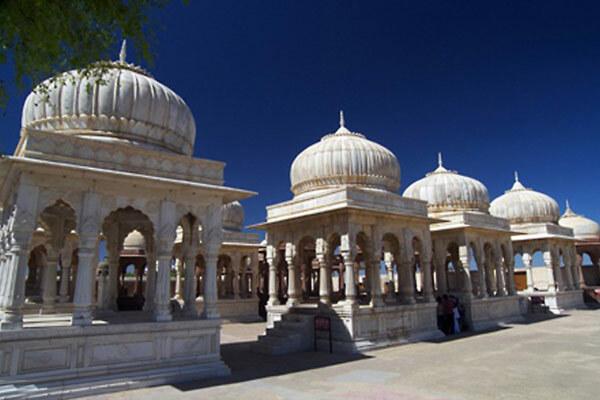 There are several other fascinating temples in Bikaner. If you don't have time for all of them, at least take a look at the impressive Rattan Binary Temple opposite to Junagarh Fort. 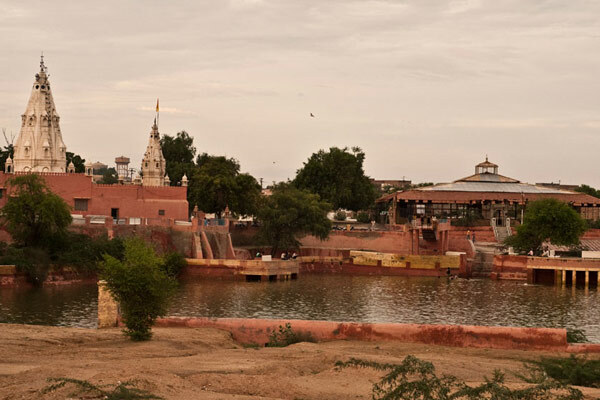 Built by Maharaja Rao Lunakaran, this 14th century temple is one of the oldest in Bikaner. Lord Vishnu and Goddess Laxmi grace the sacred sanctum of the temple. Inside is the most exquisite artwork, rich in mirror, decor and frescoes, as well as an extraordinary doorway embellished with silver work. Devi Kund or Devi Kund Sagar. Originally a royal crematorium, Devi Kund features a collection of Chattris (Cenotaphs) that narrates the bravery of Bikaji rulers. 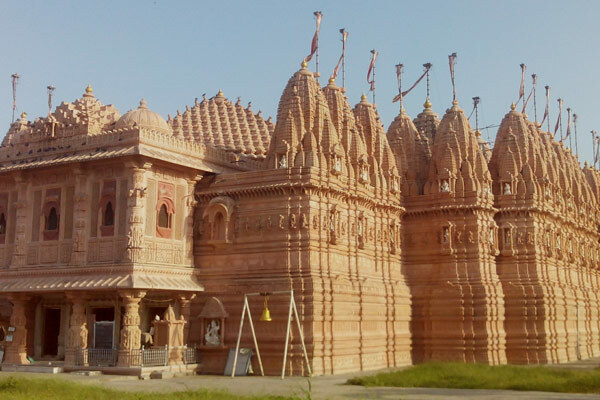 This 14th century temple is the shrine of Goddess Karni Mata, an incarnation of Goddess Durga who blessed Rao Bika and has been the titular deity of the Bikaner dynasty. The temple is unique as the rats are venerated over here and called Kabas; the shrine is a sanctuary for them. It has a richly carved entrance and superb silver doors with images of Gods embossed over it. 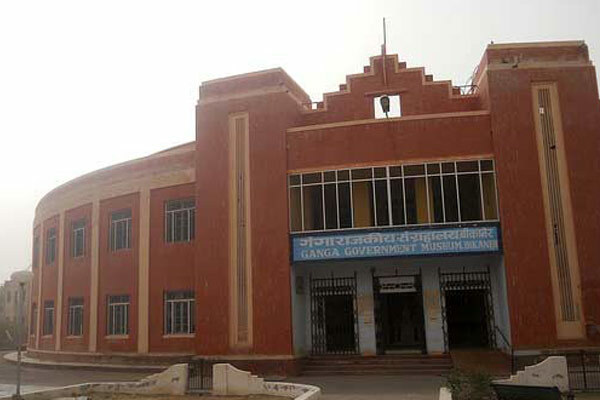 This small town features the red sandstone Summer Palace of the Maharajas, now a luxury hotel, and the Gajner National Park, a wildlife sanctuary for Chinkaras (Indian gazelle), wild boars (Eurasian wild pig), blackbucks (Indian antelope), desert foxes, blue bulls, imperial sand grouses and a large number of migratory birds. 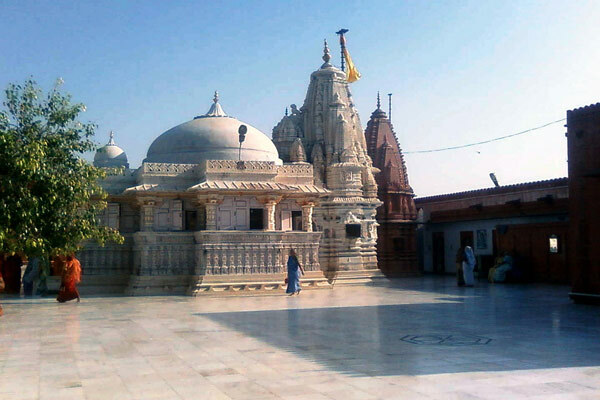 It features the temple of Kapil Muni and many other magnificent marble temples with sandstone pavilions. A large number of devotees visit the place to leave oil lamps to float in the calm waters of the lake, to offer prayers along with sweetmeats, milk pudding and sugar drops to the deity and to take a holy dip in the Kolayat Lake. It is believed that a holy dip can provide them respite from all their sins. The 52 ghats (the steps leading down to the lake) are beautifully decorated. Attractive lights impart a great look to these Ghats. In these small towns have been found remnants of pre-Harappan and Harappan settlements. It’s almost as large as Harappa in Punjab or Mohenjodaro in Pakistan, a delight for the archaeology enthusiasts. Archaeology at Kalibanga reveals that Rajasthan had been an important center of the ceramic industry. The paintings on the ancient pottery from Kalibanga bear close affinity and resemblance with the Harappan designs. 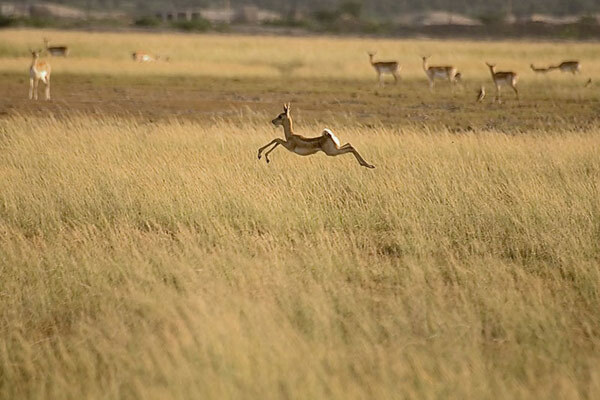 This 719 hectares sanctuary of grassland, typical of the Indian Desert System, interspersed with Acacia trees, is an ideal habitat for Indian antelopes, most commonly known as Black Buck. A large fair is held here in August or September. Devotees come in large groups from far and wide. 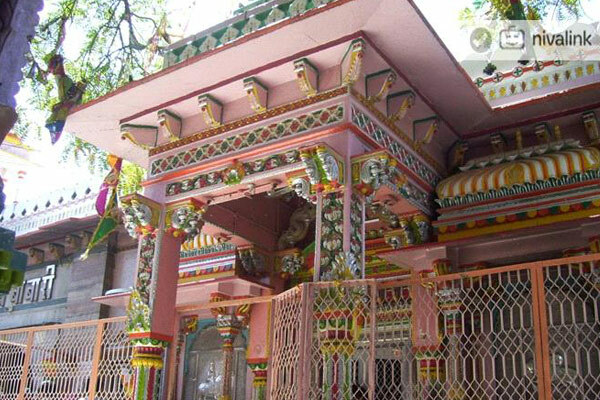 Irrespective of their caste, creed or religious affiliations, they throng the shrine dedicated to the saint worshiped by both Hindus (who call him Ramdevji) and Muslims (who call him Ramsapeer). These groups organize nightlong singing of bhajans and kirtans to pay homage to Baba.